Not sure where to report this one officially and the last time I tried to send information to the official AAVSO heirarchy I was burned so badly that I have little inclination to go searching. The observeration planning tool suggested that CN Ori might be a suitable target last night. Clicking on the link there brought up a chart. Going over to the VSP page and entering "CN Ori" eliicited a response that the name was't known to the database. I tried three times to ensure that no silly typo had been made. Easy enough to work around, of course, by entering the RA/Dec, the scale (18.5' in this instance) and explicitly setting the title of the plot. Exactly the expected result came back. It appears that the CN Ori chart is both dead and alive until you actually want to look at it. 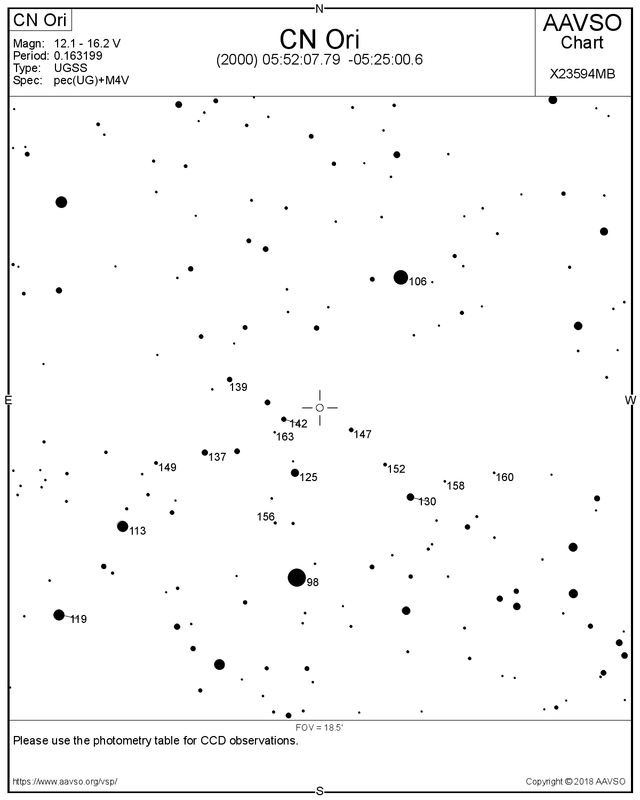 I just requested a chart of CN Ori by typing in just the star name and selecting a chart scale and it worked fine. I wonder if you had some other setting selected on the VSP form. Please try clicking the "Clear form" button first before you type in the star name. 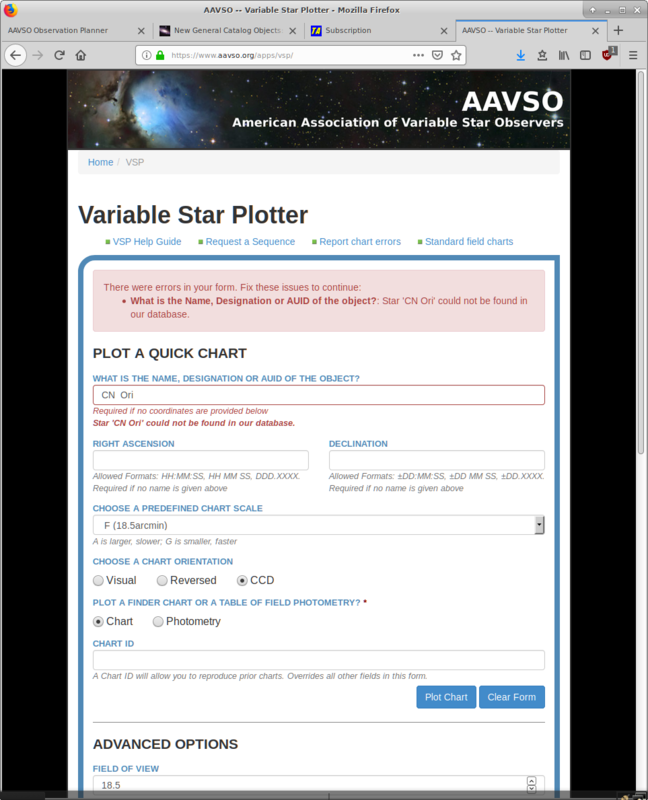 If the problem re-occurs, please send a screenshot of the form as it appears before you click "Plot chart" along with the error message you received and we will look into the problem. Not helpful! Returning to the plotter page, I get the same result as before --- screenshot attached of the browser window. This is Firefux 63.0.3 (64-bit) for Ubuntu, which should be mainstream enough. This is still a bit of a mystery as I have the same version of Firefox as you do (although I have a Mac and not Ubuntu). Of particular interest is the CSRF error message you get when you click the "Clear form" button as that shouldn't have anything to do with how you fill out the form. Have you noticed the same problem with other stars or in other places on our website? Do you have another browser you can try it on? We are looking into it, but in the meantime I am attaching the chart you requested. Has anyone else out there experienced a similar problem or know of a solution? A CSRF is a Cross Site Rerference Forgery. I think this means that the defences on the AAVSO website have detected and halted because they see a CSRF attack. This can be something that is in your browser or it can be more mundane: a certificate problem or security setting in the browser. So, make sure you system is clean: do a virus scan. Go to your browser and flush the browser cache/history. If this continues we'll escalate the help and get a web guru involved. Maybe a joint session via zoom so I can see your screen when it happens. I have no problem getting this chart. I am using Ubuntu 16.04 LTS on an Intel Gen 7 core I5. My browser is Firefox version 63.0.3 64-bit. Hope this information is helpful. It's now working fine. Clearly a Heisenbug. If you don't know that term Wikipedia will enlighten you. Good to hear it Paul. Was it clearing your cache that did the trick?